After so much self-deprecation, now is the time to show the level of arrogance readers from the other side of the Channel will expect of a true Frenchman. What better way than setting immensely ambitious goals for this post? Firstly, to consider a entire continent: Africa. According to Wikipedia’s Geography page, there are 54 countries in Africa and I obtained data for 39 of them. Secondly, to pick a very current subject: the global competition for Africa’s natural resources and the more positive and increasing interest of international investors towards Africa’s emerging economies. Finally, to focus on meaningful actors: the company directors of the 5000 largest companies in each country. How many of these ~70k very important men (and occasionally women) have a French name or an English name? Our method of name classification can be summarized as follow: if a company director were to become an Olympic athlete (after a bit of training of course), judging from his name only and the publicly available list of all ~150k Olympic athletes since 1896, would he most likely run for France or for Great-Britain ? The illustration is straightforward to read. In the map above and left, areas in blue have the highest proportion of directors with a French name (FR). In the map above and right, areas in red have the highest proportion of directors with an English name (EN). The synthetic map below shows areas almost exclusively French, almost exclusively English and also some areas where French and English business communities are likely to compete (FR vs EN). What does this map tell us? It visually confirms what the historian Fernand Braudel, in his book a Grammar of Civilizations, called the “linguistic joke played on Black Africa by the colonisation: instead of gaining one international common language, it got two”. It also tells us that this divide remains actual, affecting the way European and American companies do business in Africa now and in the foreseeable future. 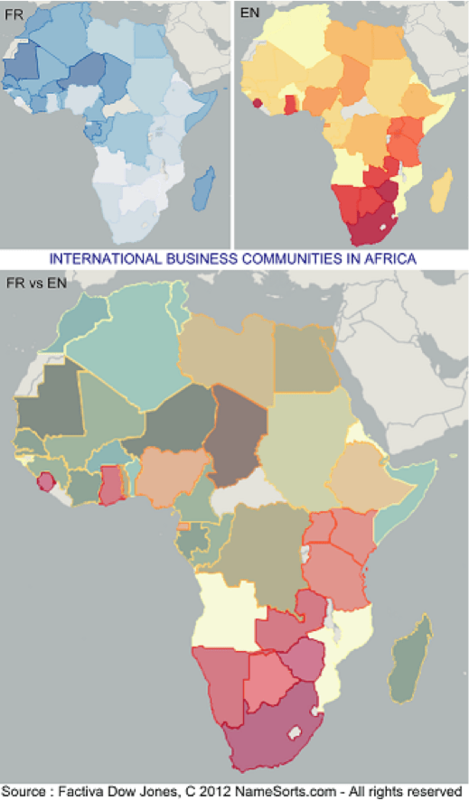 Can onomastics be useful to monitor western Foreign Direct Investments (FDIs) in Africa? I believe so. As explained in an earlier post, European companies -for example- demonstrate little diversity at the top: Greek companies have Greek directors, etc. Large foreign subsidiaries will have expats on the Board of Directors, nominated by the head office, most likely of the same nationality. There are limitations to this approach, of course: the accuracy of name classification itself (normally within a 75%-95% range). Also, investments from the USA, still the world leading economic power and a “melting pot“, are difficult to distinguish from other sources of investments using onomastics only. But it would probably work well to monitor -for example- Japanese, Russian or Chinese investments in Africa.